New Zealand have won their first Test in the Pacific Islands, but the most experienced All Blacks team in history was made to work far harder than had been expected in defeating Manu Samoa 25-16 at Apia Stadium. The historic Test featured a tremendous battle at the breakdown and punishing defence from both sides, each closing down the other quickly to prevent the opposition's power runners, but mistakes either side of the ball and a combined 22 penalties reduced the tempo of the fixture that produced few noteworthy highlights apart from the match itself. George Moala, on debut, crossed for the pivotal score shortly after half-time, the winger collecting Dan Carter's banana kick-pass in first phase from a scrum drive. Carter kicked from halfway to exploit space outside Alesana Tuilagi and the winger collected the ball on the fly outside Samoa's 22 before cutting inside Tim Nanai-Williams and beating the desperate attempted tackles of Tuilagi and Paul Perez. Samoa brought the full-house crowd to life in the 64th minute, exploiting a knock-on from Sonny Bill Williams in contact; Samoa effected the turnover and Alafoti Faosiliva made a huge midfield bust before being tackled and then got the ball back from Kahn Fotuali'i almost immediately to rumble through a hole and weak New Zealand defence to give the hosts hope of an upset. 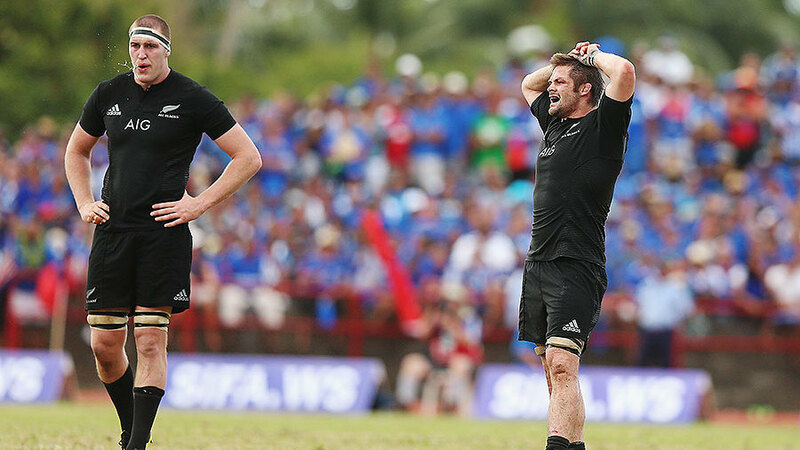 But Carter landed his sixth penalty goal from seven with six minutes to play to put New Zealand ahead by more than a converted try, and the All Blacks, who boasted a combined 868 Test caps and 442 years, saw the game out after almost crossing again following a length-of-the-field bust from Charles Piutau. "I'm just pleased we got up on the right side of the scoreboard," Richie McCaw said, the All Blacks captain "proud of the way [we] stuck at it" at the "start of a big campaign". "Remember this one and move on and enjoy it, but there is some work to do, isn't there?" McCaw also paid tribute to Manu Samoa, saying "you've got a pretty special team". "That's what test match rugby is about," McCaw said. 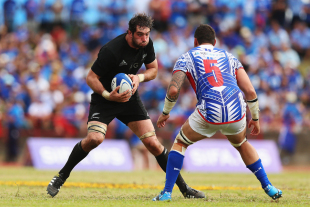 "Manu Samoa kept coming at us." Tuilagi said "I hope this is the start of our campaign [to play New Zealand more often]". "Hopefully you will come back and we will try again and again and again."